On Friday, 9 October 2015, the first stone-laying ceremony for the Large Size Telescope (LST) prototype took place at the Roque de los Muchachos Observatory (ORM) on the island of La Palma. 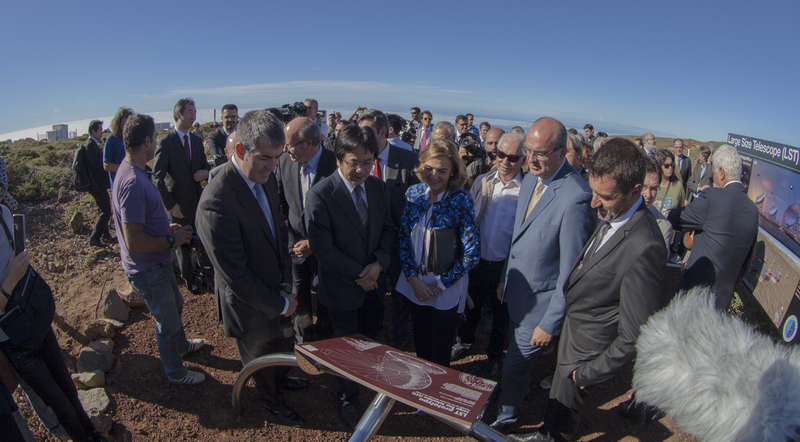 To commemorate the event, Fernando Clavijo, President of the Autonomous Regional Government of the Canary Islands, unveiled a plaque with the design and main features of the telescope. Other attendees included Rafael Rebolo, director of the Instituto de Astrofísica de Canarias (IAC); Takaaki Kajita, director of the Institute for Cosmic Ray Research (ICRR Tokyo); Martín Taño, the Mayor of Garafía; Anselmo Pestana, President of the Cabildo of La Palma; Carmen Vela, Secretary of State for Research, Development and Innovation; and Kazuhiko Koshikawa, ambassador of Japan. The LST project leader, Masahiro Teshima (ICRR Tokyo and director of the Max Planck Institute for Physics in Munich) and Manel Martínez (Institut de Física d’Altes Energies and chair of the LST steering committee) explained the telescope’s main characteristics and its importance in the research of cosmic gamma rays. The LST prototype telescope is scheduled to be installed in the ORM site before the end of 2016 with the commissioning phase until mid 2017. The main goal of the prototype is to verify the design parameters of the structure and the camera. Construction of a Large-Sized Telescope prototype is currently underway on the La Palma site and can be watched live here: http://webcam.lst1.iac.es/stream2view.htm. For more details and photos/video from the event, visit the IAC website.